The Hellroaring pack formed when the Geode Creek pack dissolved, creating some vacant territory. Two males from the Leopold pack (287M and 468M) joined up with a female that was born into the Druid Peak pack (353F). This pack likely formed too late in the season to have pups in 2005, but the alpha pair (353F and 287M) did produce 4 black pups the following year in 2006. This pack eked out a territory neighboring the Slough Creek, Agate Creek, Leopold, and Oxbow Creek packs resulting in aggressive interactions with neighboring packs. 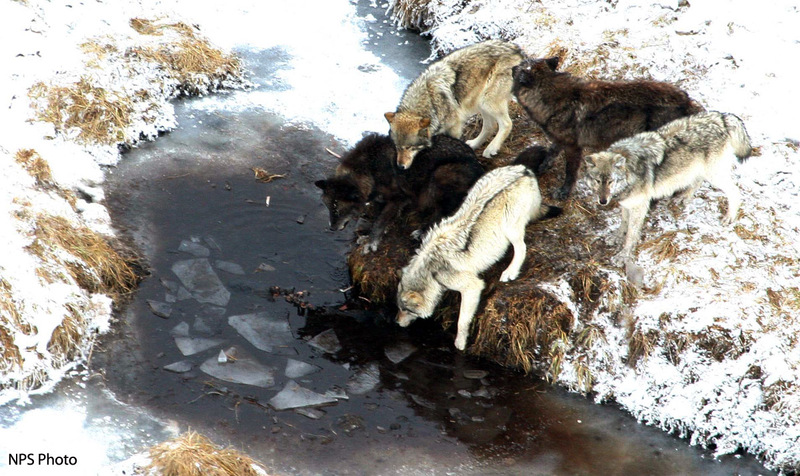 After interactions with the Agate Creek pack in 2007, 2 pups were never observed again and were presumed dead. The alpha male (287M) was killed by other wolves in the same year. Of the 4 remaining wolves, the two remaining radio-collars (353F and 468M) likely malfunctioned, making tracking more difficult. By March 2007 none of the Hellroaring wolves were observed and the Oxbow Creek pack was regularly observed in the Hellroaring pack’s historic territory.